We rewind to the beginning of the wine scene where Tae Ik was ignoring Se Ryeong. Snowflake is so selfish as not to really care about Tae Ik. Even if he still had some part of himself that liked her, doesn’t she realize she caused him great pain and doesn’t deserve the right to talk about how she sincerely wishes to get back together with him? Tae Ik not revealing the photo…was it really to protect her? Somehow, I’m not convinced of that. Anywho, Man Ok comes downstairs and looks shocked—who can blame her to find the two “embracing” in the living room. Man Ok can’t escape since Tae Ik has already seen her. She quickly says it’s now raining and she has laundry outside. She then hurriedly leaves the room. Tae Ik finally gets Snowflake’s claws off him and says that she’s wrong. He doesn’t want to be entangled with her any more. He would rather be misunderstood as being in a gay relationship with Won Kang Hwi. Snapple! LOVED that. 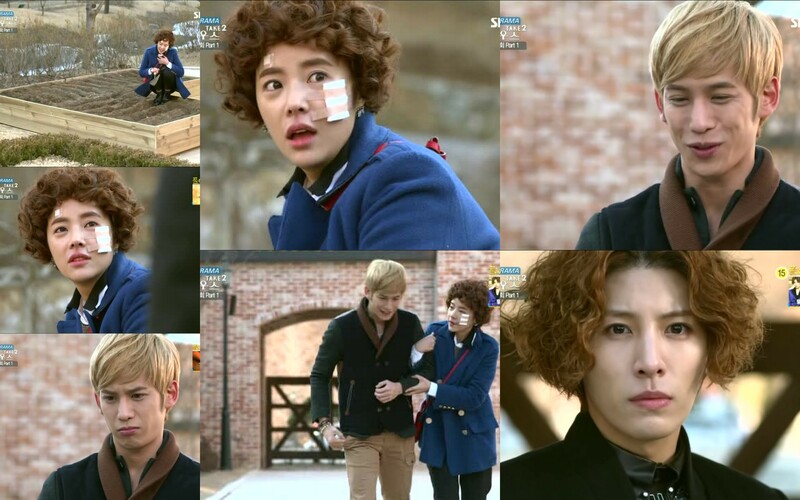 I’m sure that just might fuel more of Se Ryeong’s hatred towards Kang Hwi, but who knows? Snowflake then reveals she knows Tae Ik’s engagement is all a lie. She’s world star Jin Se Ryeong. She gets whatever she wants when she wants it and discards it whenever she wants it. Are you freaking kidding me? This girl is a horribly selfish witch. She’s EVIL. Just plain EVIL. Man Ok is outside (where it ISN’T raining and there’s no laundry to be seen) recalling the conversation she overheard. She then starts angrily digging in the newly dug up veggie garden. Why did she run out? Now she’s stuck out there freezing. Tae Ik then comes out and throws a hooded kitty blanket over her and asks if she’s an idiot to be gardening in the middle of the night. Heehee. Man Ok cuddles inside the blanekt. Tae Ik’s face softens. “Let’s go back inside.” What about Se Ryeong? He could care less. Isn’t Man Ok coming with him? Yep. The two walk in together as Snowflake watches on. She sits down and crumples the picture of her, Tae Ik and Kang Hwi. She won’t sit still. Awww, is her ginormous ego hurting? Good. Wellllll…not so good as you know she’s going to wreak havoc. The selfish witch. Snowflake is being interviewed and is asked why she turned down foreign love calls (from directors, etc.) to come back to Korea. Snowflake then says she came for a personal reason. She is then asked what that reason is. There is something she needs to get back. What is that? She can only tell them she has something she get back and that’s it. The interview then ends and Bum Soo starts passing out his usual ginseng packets, this time with Se Ryeong’s face on them. He tells her Reporter Nam is ready for his interview. Too bad, Snowflake has a run in her stockings. Bum Soo needs to buy her a new pair. He looks over as the waiting reporter. AFTER this interview. Nope. If he doesn’t do it now, Se Ryeong won’t do the interview. Somebody slap her. Better yet, Man Ok should do one of her infamous hapkido flips on this chick. Bum Soo then leaves to do her bidding. Bum Soo leaves after telling Nam it will be a minute. Snowflake calls him over and tells him she’s ready. She then tells him to close his laptop as there is no interview. Instead she hands over the fake couple pictures. You selfish pig. Later, Joon calls Tae Ik into the office where Snowflake is sitting. Joon tells him the album finished up nicely. Did Joon really call him there just for that? Of course not, he called him there so the three of them could all eat a meal together. Tae Ik rushes out and Joon laughs at the young punk while Se Ryeong fumes over hurt pride. As Man Ok was about to get into the van with Tae Ik, the angry Snowflake yanks her out and gets in herself. What is she doing? Se Ryeong asks Tae Ik the same question—what does he think he’s doing? Omo. Is this all because she’s a big world star now? Someone needs to deflate that ego. Can’t she tell that while the engagement might be fake, Tae Ik does have some feelings for Man Ok? Tae Ik tells her to get out and she yells at him to eat with her. Does he have to go this far? Tae Ik then demands to know why she’s doing that to him as well. He’s really sick of her. He then angrily gets out of the car. Go Dong tries to stop him, but Tae Ik yells at him to let go. Man Ok then rushes after him as Se Ryeong calls reporter Nam to hurry and release the news she gave him. Tae Ik grabs a cab and Man Ok manages to get in before it takes off. 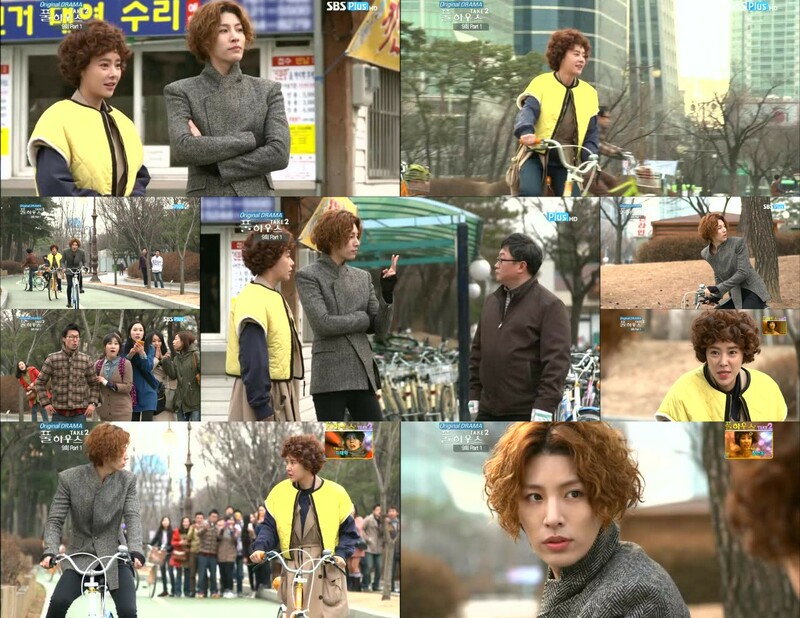 She directs the cabby to go to Full House, but Tae Ik replies he doesn’t wish to go home. So…where to go? Just drive straight for now. Man Ok then asks if there is anything he wants to do or any place he wishes to go. Tae Ik then sees couples outside. Should they really do it? What they faked earlier? LOL. Hahahaha. So cute. The two end up at a mountain path, both not dressed for hiking. Man Ok looks at him—can he really make it to the peak? Tae Ik tells her not to underestimate him, but not too long into the hike, he stumbling and gasping for breath. And he’s a dance singer? Shouldn’t he have better stamina than that (I was laughing so much at this point). Man Ok laughs as well as the other hikers stare at Tae Ik who’s telling her he can’t go any further and wishes to go down. Man Ok goes down and tells him there is only a little bit left and they can’t go without reaching the peak. She then drags him to the top. LOL. Nice one. At the top, Man Ok takes a commemorative photo of the event. Isn’t the view great? Man Ok then yells “Yahoo.” She then turns and tells Tae Ik to yell as well as it will make him feel better. Tae Ik, being the cool Tae Ik he is, refuses. Man Ok then starts yelling “sagaji” and “completely petty” at the top of her lungs. This makes Tae Ik mad. What is she saying? She turns at him and tells him to go ahead and yell “yah” as loud as he can. Tae Ik does and gets louder and louder as he happily smiles at her. So cute. The two laugh together before Man Ok then says they have no time and must go down to their next destination. Is she serious? The two then end up at a bike rental place. Man Ok wants to ride the tandem bike, but Tae Ik wants two separate bikes because Man Ok is “heavy.” The man brings out the bikes and says that if they exceed the time limit, there’s an extra charge. Man Ok grabs one bike and immediately takes off while Tae Ik follows behind her. They ride happily and Man Ok notices people are gathering and taking pictures. Tae Ik stops and waits for her and she tells him they should go and buy some hats first. He says since they are engaged, there is no need to hide like they have sinned. He then points to a convenience store. Last one there has to buy ice cream. He then takes an early start and Man Ok follows behind him saying he fouled by taking off first. Our idiot stalkarazzi are in their own office. Seo is trying to get Ga Ryeong to spill the beans about Man Ok’s past when Nora comes across the fake engagement article. Seo is unhappy he didn’t get the scoop and Ga Ryeong is enraged that Man Ok has continually lied to her so she reveals ALL of Man Ok’s personal information—her age, her high school, etc. WHAT A HORRIBLE FRIEND. Meanwhile, the two love birds are sitting outside drinking coffee. Man Ok leans against Tae Ik’s back since they are sitting at different tables. Doesn’t it feel like they are on a secret date? Tae Ik then asks Man Ok to put her hand behind her back. Man Ok does and Tae Ik takes it. He smiles and says now it’s a secret date. Things get a bit awkward and Tae Ik takes his hand away. That’s a hard posture to maintain. Man Ok then goes to sit across from him. He notices her face is red. Is she hot? LOL. He’s teasing her, the little rascal. He then stands up and leans across the table. People start taking pictures of this with their cells. Man Ok asks what he’s doing. Why? Does she think he’ll give her the infamous Secret Garden foam kiss? Man Ok’s eyes widen. He tells her she’s watched too much TV. Tae Ik then straightens up and goes off to the bathroom. At this time, the person who took the photo then sends out the fake couple’s location. A trio of angry high school girls get the information and are in the vicinity. The quickly spot Man Ok and head over. Tae Ik gets out of the bathroom and smiles at Man Ok from afar. He doesn’t catch the attack of the high school girls as he’s distracted by fans asking for a signature. While Man Ok is getting beaten by them, he gets a phone call. It’s Go Dong asking where he is. Tae Ik says he’ll return shortly so don’t worry. Go Dong then then says that isn’t it. There’s a big problem. Is Man Ok with Tae Ik? This immediately gets Tae Ik worked up. Tell him what’s wrong!!!! Go Dong says an article has hit about the engagement being fake. This immediately causes Tae Ik to worry. He looks for Man Ok and finds her being beaten with a crowd looking on. Tae Ik rushes out and throws one of the girls off of her. Is she okay? Man Ok says she is and Tae Ik yells at her. She’s a master of hapkido, she shouldn’t be getting beaten. She should throw them and run away. He then goes to take her to the hospital when they overhear the girls saying one of the girls isn’t waking up. Are you freaking kidding me? Great. Man Ok and Tae Ik turn around and see two of the girls trying to wake the third. At the hospital, Man Ok has been taken care of and they await the news on the high school girl. Go Dong comes out and Man Ok immediately jumps up. Is the girl okay? Yep, she just lost consciousness because she was too worked up. Omo. Well…blood pressure rising quickly is dangerous…but you know the reports won’t be good. All she needs is rest, so don’t worry. Man Ok is relieved and sits back down. Tae Ik is relieved as well. Go Dong tells them to go home first as he will guard the girl and take her home. Tae Ik gets up and Man Ok quickly follows after him. Joon then calls asking after the situation and Go Dong reports the girl is fine and Tae Ik is heading home. At the house, Man Ok tells him to go up and rest. He turns with a tired expression and says he’s going upstairs. Man Ok then opens the fridge for some water. As she drinks it, the angry Joon comes in and demands to know where Tae Ik is. Man Ok tells him he’s upstairs. Joon rushes up and grabs Tae Ik by the collar. How could he do such a thing? The fake engagement being revealed wasn’t enough? He had to go and hit a fan with the album release being so close? He then demands to know how Tae Ik could stab him in the back. Man Ok comes up and overhears this last bit. Joon says this is all man Ok’s fault. She deliberately approached Tae Ik and caused all of this. Tae Ik shakes off Joon’s hands. What did he say? Joon decides to spin things that Man Ok was a crazed stalker who harassed the tragic star. Eyeroll. Is that even believable? Tae Ik yells that this was all Joon’s doing. That was then this is now. With all the money Joon has put into Tae Ik, he’s making Man Ok the scapegoat to save the situation. Tae Ik asks what will happen if doesn’t dance to Joon’s tune. Joon laughs. Because of a stylist? Tae Ik’s fist clenches. Joon tells Tae Ik to do as he’s told and throw man Ok to the wolves. The press conference will still be held on schedule so they should finish things up nicely. That above conversation just reminded me of Manager Kim and Min Woo from Oh! My Lady. Of course, Gae Hwa was never in any contractual engagement with Min Woo at all. But when things got out of hand, the dirty manager was ready to throw Gae Hwa under the bus and pin something unfair on her just to save Min Woo’s career and his way of making money. Funny, isn’t it? Got to love parallels. In her room, Man Ok recalls the conversation between Joon and Tae Ik. What will she do? At this time she gets a call from her grandfather. Jang is immediately concerend with Man Ok’s voice. She says she is fine. There’s no problem with the studio at all. Her grandfather hangs up and she cries and apologizes. Poor Man Ok. She doesn’t deserve what’s being thrown at her. I hope that Tae Ik does something huge at the press conference. The next morning Kang Hwi comes up and yells for Man Ok. Today’s the day his cast gets removed. Man Ok is nowhere to be found and all that is there is the evil Snowflake who gleefully tells him that horrible news happened while he was locked up in the basement. Kang Hwi tells her to tell him properly. Se Ryeong reveals the fake engagement article was published and Man Ok was attacked by saesang fans and Tae Ik even used violence against them. Kang Hwi closes his eyes and tries to hold onto his temper. Snowflake gleefully says that Joon popped a vein and is acting crazy. Where is Tae Ik? Snowflake says he’s up in his room as she hasn’t seen him all day. Kang Hwi storms off and Se Ryeong says that only after a storm passes can the sky be clear. Don’t think he’ll come to you evil, heartless witch. He won’t. Kang Hwi storms into Tae Ik’s room demanding to know what the hell is going on. What is Tae Ik going to do, is he really going to dump everything on Man Ok? Tae Ik tells him not to worry as he will take care of it. Kang Hwi asks how. Tae Ik tells him that this is his problem and not to worry. What can Tae Ik do when he’s only Joon’s puppet. What’s happening to Man Ok now is just like what happened to Kang Hwi. Tae Ik’s fist curls and he starts angrily shaking. Kang Hwi then says that if anything happens to Man Ok, he won’t let Tae Ik go. Poor Tae Ik-ssi. Man Ok is out digging in the garden singing about being happy. Self hypnotism? Kang Hwi asks what she has to be happy about? He then tells her to continue singing. He then starts singing the same thing in Chinese. He then reminds her about his cast getting taken off. Man Ok supports him as Tae Ik comes out. He looks after them. What will his decision be? It won’t be bad as you know that he can’t throw her under the bus. Kang Hwi is happy to get his cast off and wants to go out and celebrate. Man Ok then says that they shouldn’t go out because what happens if he’s recognized? She’ll make him something delicious at home instead. What does he want? Kang Hwi then touches the bandage on her cheek. Her pretty face can’t scar. Man Ok assures him she’ll be fine. She then gets a call. It’s Go Dong asking where she is. Is Tae Ik with her? No. What’s wrong? The press conference starts at 2 and Tae Ik is nowhere to be found. End episode. What is he planning? Can’t wait til tomorrow!!! Well…If I have jury duty, no morning recaps as I’ll have to leave even earlier. This was such a great episode! There was so much cute between Tae Ik and Man Ok.
Kang Hwi stirred jealousy up by threatening Tae Ik if he hurt Man Ok. Kang Hwi was pretty great. Looks like Joon’s life is going to become even more miserable. Yeah! Kisses, when are we going to get kisses? If you have jury duty we will just wait for when you have time to do the recap. Hope all goes well. Kiss) and the holding hand we all know that they both enjoy it but don’t want to admit it to themselves and each other…And I feel sorry for Man Ok she doesn’t deserve the treatment she getting from Joon and the fans and most of all Tae Ik the president take advantage of him much and also Kang Hwi too he ruined also because of president…I can’t wait to see the evil president and snowflake lose..